When we left you last night, it was still blowing up to 30 knots and some of the seas were steep enough that we surfed down their faces - not a fun prospect at night. But we could tell that things were moderating. Our weatherman in the Virgin Islands (George, KP4G) actually calls me, rather than waiting for me to check in. He's taken a special interest in us, which feels good. So we started the night with about 1/3 of our jib rolled up, but by 11pm the wind had dropped and we'd let it all out (we're good at that ). It was one of those glorious sailing nights: an almost full moon lighting our path, the boat responding well with no gear strained, the oily black water chuckling quietly against the bows and then sliding past, quiet conversation with your watch-mate (we're standing 2 person watches) as the miles roll between the hulls. This is what night sails are supposed to be like. The wind continued to moderate all night (as expected) and at first light Sue woke me for my watch by presenting me with my oilies (foul weather gear) and telling me to hoist the main. Under jib alone our ETA was about 3pm, but the main pushed our speed up so we arrived just after noon. We all immediately jumped in the water, showered off, put on clean (not salty!) clothes and sat down to Amanda's excellent pizza lunch. 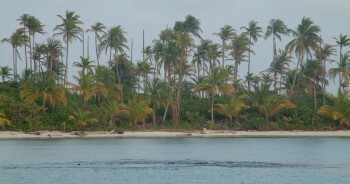 So we're anchored at the east end of Hollandes Cays in the San Blas. This place is amazingly beautiful. We're surrounded by 5 small (3-20 acre) islands, with more in the distance and the Panamanian mainland about 10 miles away. 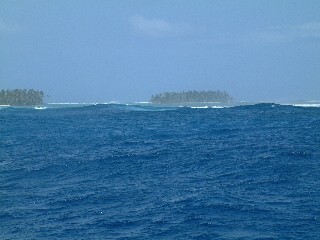 There are lots of reef systems around us, the closest two about 100 yards away. The water shades through every color of blue, turquoise, and aquamarine that so characterizes the Caribbean to me. The islands are crowded with coconut palms and have small white sand beaches all around them. The interiors are usually well picked up by the families that come out to "watch" (ie, pick up) the coconuts. Today we just crashed after lunch, surfacing briefly when our friends on Wanderer 4 came in at about 5pm. Tomorrow we'll do a bit of exploring (and I want to get out in the sailing dinghy). We'll also do some picking up, washing up, and celebrating our arrival with a BBQ on the beach under the full moon.